Simply put, Oktoberfest is the world’s largest outdoor party. It’s held annually in Munich, Bavaria, Germany. The 16-day festival runs from late September to the first weekend in October. 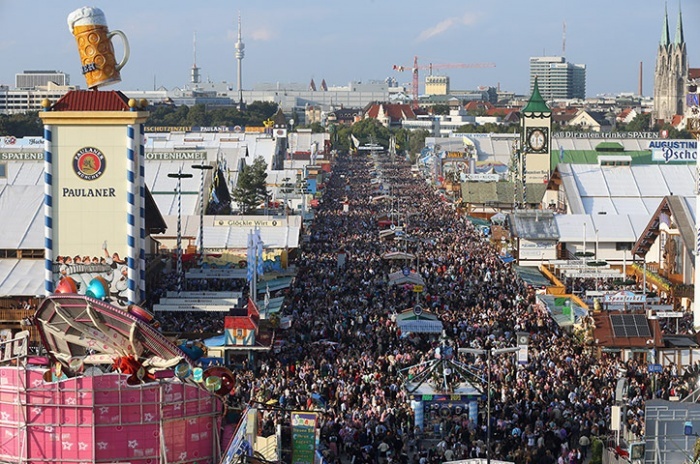 Many of the locals refer to it as Wiesn, which is short for the grounds it’s held on. Having been held since the early 1800’a it’s an important part of the Bavarian culture. Most other Oktoberfest around the world have been patterned after Munich’s, they’re just a little smaller. Munich’s averages about 6 million visitors per year! If you like to eat German food, you’ll love Oktoberfest, check this menu out. Hendl (roast chicken), Schweinebraten (roast pork), Schweinsh axe (grilled ham hock), of course they’ll have plenty of Würst (sausages) along with Brezen (pretzel), Knödel (potato or bread dumplings), Käsespätzle (cheese noodles), Reiberdatschi (potato pancakes), and Sauerkraut. If you’ve been to Milwaukee’s German Fest this may sound familiar. One of the sausages served at Oktoberfest is Weisswurst (a white sausage containing veal). This delicious sausage literally melts in your mouth and is one of my favorites. We make it at Usinger’s and ours is equally as delicious. Oktoberfest brats are also a seasonal favorite. They are just a bit longer than regular brats and spiced perfectly. 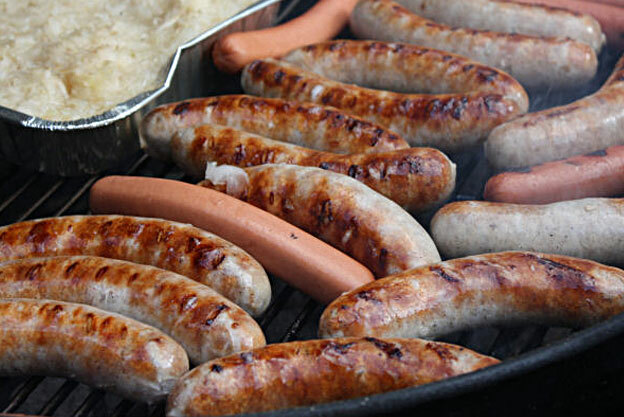 If you’re celebrating Wiesn stateside this year, put some Weisswurst and Oktoberfest brats on the grill and it’ll go a long way toward giving you the taste of Munich’s Oktoberfest. The Wisconsin State Fair begins its 11 day run on Thursday July 31. It has become a Wisconsin tradition each summer and it’s been around even longer than we have. The first Wisconsin State Fair was held in Janesville in 1851. It moved around quite a bit the first 40 years, but settled in Milwaukee at its current location in 1892. Usinger’s is a proud participant of the fair and has a booth in the Wisconsin Products Pavilion with many other great Wisconsin companies. You will find some of the best food at the fair in the pavilion and also some of the best prices. From apples to ice cream and potatoes to Usinger brats, it’s the place to go. Usinger’s is Milwaukee’s oldest and still family run sausage kitchen. 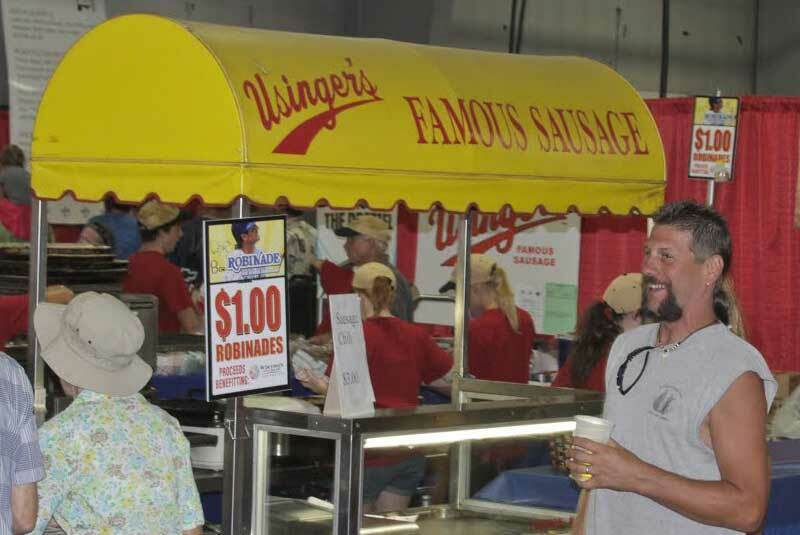 Come visit the Usinger booth inside the air-conditioned Wisconsin Products Pavilion. There you will find the best food at the best price at the fair. Here is what’s on our menu. All are served on delicious Miller Bakery Pretzella buns and are just $ 4.00 each! Try something a little different on your grill this summer. A Usinger Smoked Brat with Cheddar Cheese & Jalapeno Peppers. This is one of my grilling favorites. 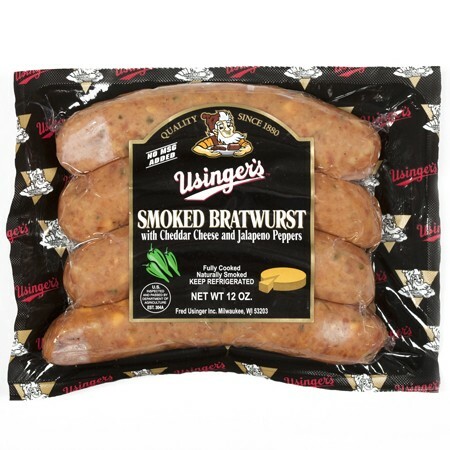 To create this awesome link, we started with a Usinger Smoked Brat mix, then added apple wood smoked bacon bits for a campfire taste, Cheddar Cheese for flavor and pieces of Jalapeno Peppers for good measure. We packed them all in a natural casing and then hardwood smoked them. This is the complete sausage, no condiments needed, well maybe a great sausage roll. But seriously, you’ll want to enjoy all of the great flavors so don’t cover them up with a bunch of add-ons. These sausages are fully cooked, so you just need to grill them over medium heat to warm them completely through to get the cheese melted and the outside skin crispy. Try not to crack the casings because you won’t want to lose any of the flavor. 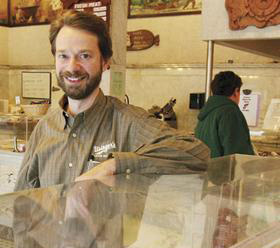 Fritz talks about the the past, present and future of the sausage business and Usinger’s. Follow these easy tips to become the Grilling Guru of your neighborhood this summer. When preparing sausages on the grill follow these steps to earn expert status and avoid incinerating your sausage links. The links you will be grilling should come from the refrigerator, not rock hard directly from the freezer. All sausage should be thawed in the refrigerator prior to use. The grill. Gas or coals, the plan is the same. Low and slow to avoid temperature shock to the links because they will split and lots of the flavorful juices from inside the sausage will be lost. Use the grill cover to keep in the heat during the beginning. For a gas grill, warm it up on high, then just before placing the links on the grill turn the heat to low. Start the sausages on low and every few minutes turn the links and increase the heat just a little bit. Follow this sequence for about 10 minutes. Then the next 5 minutes is where the real cooking begins and you need to baby that sausage. Bring the heat up to high, you want to brown the link and “crisp up” the outside casing and cook the link to the center. Charcoal grill. The coals need to be completely white, then you can start. Spread the coals out. Start the links on the outer perimeter where there is less heat. Turn the links often and gradually move them to the center of the grill. Follow this sequence for about 10 minutes. The center of the grill should be the hottest and this is where “crisp up” happens during the next five minutes until the sausages are cooked through. Once the links are well browned, you hear them hissing and sizzling they are ready to enjoy. 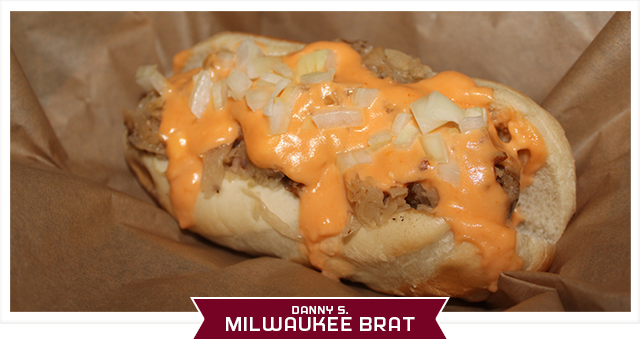 Congratulations to Dan from West Allis, his “Milwaukee Brat” was voted the winner in the “Bucks Best Brat Contest”. Fritz checks out “Bucks Best Brat” Finalists. Longing for the “Hot Dog” daze of Summer? Around here we love our brats, but there really is nothing better hot off the grill than a natural casing wiener or frank garnished with garden fresh tomato dices all packed into a fresh warm roll. Yum! Call them what you want franks, hot dogs or wieners they’re all cousins. 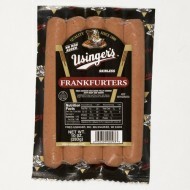 We make lots of them at Usinger’s in all beef or pork and beef varieties. Both are smoky with lots of spices working together and the all beef has a hint of fresh garlic added. What you won’t find is MSG, Gluten, fillers or milk powder in our “dogs”. My favorite is the curved link of a natural casing wiener that “pop” when you bite into them. The casing provides a firm bite and holds all the flavorful juices and spices inside the link during cooking. Try to avoid splitting them while grilling, usually this is done by cooking slower over a lower heat. If you prefer a softer bite on your hot dog, we also make them without the casing. These are called “skinless”. They are made with the same recipe; we just peel the casings off before they go in the package. Skinless wieners are very popular with kids, so if you’re grilling out for some youngsters they make a great choice. Look for the links that are straight without a curve. Click the link below for a video of Hans Weissgerber III and Fritz Usinger at Fred Usinger Day February 23rd, 2014.